The season is almost over, folks. After getting crushed by Pittsburgh on Monday, the Rangers are facing Boston tonight. The Bruins would be in first place if not for the runaway Lightning, and would probably win the President’s Trophy. The B’s are that good, and tonight might be even worse than Monday. Henrik Lundqvist is back in action. He’s getting more rest down the stretch than we are used to. I like this approach, since Hank is clearly no spring chicken anymore, but yet is still capable of being an elite goalie. It also gets Alex Georgiev some additional starts. That’s a win-win for me. 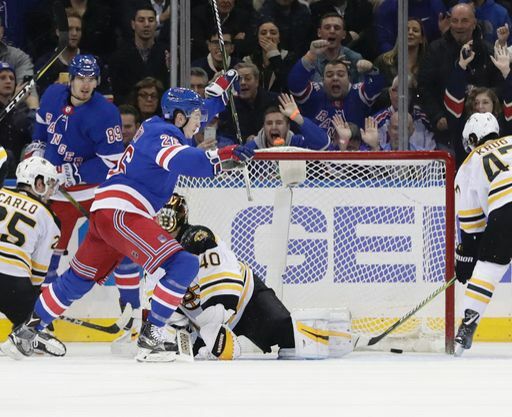 Chris Kreider is getting there, but he’s not coming back tonight. I’d expect the same lineup as Monday. Crazy Prediction: Someone punches Marchand. Was just thinking to myself about how happy I am right now that we didn’t draft Wahlstrom. Not to in any way suggest he’s a bust (way way way too early to say that), but it must be a little disconcerting to the Islander organization that he just had a very mediocre year at BC and then quickly jumped ship. I can only imagine the chirping that would be going on in here right now if we had drafted him. Gorton must go!!! I believe the golden boy Claussen has been on the ice for all Boston’s goals. This season can’t end soon enough. There is just no semblance of defense being played in front of the net with Hank having little to no shot on 5 of those goals. At this rate he will hit 450 wins sometime in January 2020. Yikes. But one positive is Mika hitting 30 goals and 70 points. Great season for him. Nah, it will happen soon and we’ll screw up our draft position. So sayeth the Hockey Gods.